CN Tower Illuminated - Toronto, Meet Your New Skyline! With great fanfare, a few too many speeches, some bagpipe action, and plenty of 'oohs' and 'ahhs', the CN Tower officially switched on its illumination around 10pm earlier tonight. While we've been seeing the new system tested over the past several weeks, the light show that they put on tonight was nothing short of spectacular. Keep reading for video of the 10-minute show, photos, and details on the lighting units themselves from inside the tower! I've seen them testing the new system a number of times over the past few weeks, but it wasn't anything like I saw tonight. Pulses of light illuminated the lower observation deck while colours gently flowed up and down the elevator shafts of the Tower. The fluidity and colour range of the light animation is really the remarkable thing, which I hope the video of tonight's Architectural Illumination launch helps illustrate. I spoke to a representative from FLAP (Fatal Light Awareness Program) earlier in the evening, who was happy that officials from both the CN Tower and Color Kinetics (makers of the new lighting system) sat down to talk with FLAP about the potential impact on migratory birds, and what can be done to reduce that effect. She was, however, concerned that all that had been made was a verbal agreement to FLAP that officials would do their best to 'mitigate bird mortality', as stated in the CN Tower press release. Seeing as how the lights are directional though (not facing outwards, but inwards towards the tower), I would think (and hope!) that this would lessen the amount of bird deaths the Tower might cause. Officials also supposedly assured FLAP that the amount the lights would be utilized during migratory season would be significantly reduced. There's also the matter of power consumption that a lot of you raised concerns about when we originally saw them lighting up the Tower. The good news here is that this new system uses 10% less energy than the former dimly lit tower (and looks a hell of a lot better to boot). The new LED fixtures are also a heck of a lot smaller, as you can see below. The original lighting units were about as big as washing machines. This isn't just merely static bulbs that turn on and off to accent the tower. 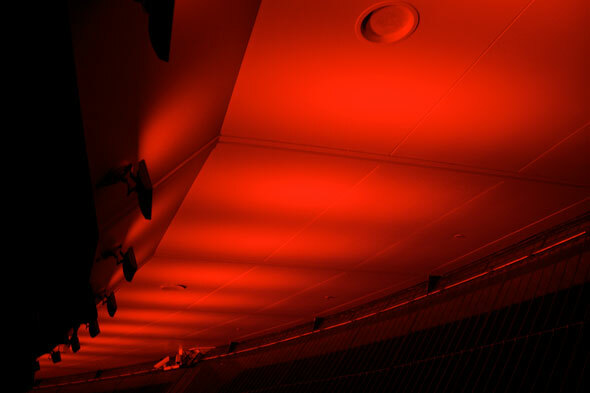 Each LED fixture contains an array of dozens of LEDs. As you can see in the photo above, which was taken at the top of the CN tower on the observation deck, the entire system is made up of these tiny panels. To simulate white light, all the colours on the panels light up at once. I was under the impression that the LEDs were much brighter and more powerful up close, but they weren't in the least. It's amazing how efficient these tiny lights are. I hadn't been to the top of the CN Tower since I was five years old. What a difference nearly two decades made! The lighting is quite the sight to see from the glass floor now, and the observation deck is completely lit up in a variety of colours. So if you're like me and you haven't visited the Tower in some years, it's probably worth doing it this weekend. From now until July 1st, you can make your way to the top for only $10 from 8pm-close, as well. The whole thing was well received by the large gathering of people outside the Tower at Roundhouse Park tonight, as people screamed out enthusiastically while the new system went through its paces. Love it or hate it, the new, colourful CN Tower is here to stay, and is going to drastically change the look of our nighttime skyline. I love the look of it, and am delighted to see this bold venture, among others such as the new ROM and LuminaTO festivals, which force people to look upon the environment around them with a new perspective. The lighting will now be a nightly feature at the CN Tower, beginning at sunset and continuing until 1am every night, with shows at the top of each hour. Special shows will also be done on holidays, with next week's Canada Day being the first. Lead photo by Jerrold, and other photos and video by Adam Schwabe.